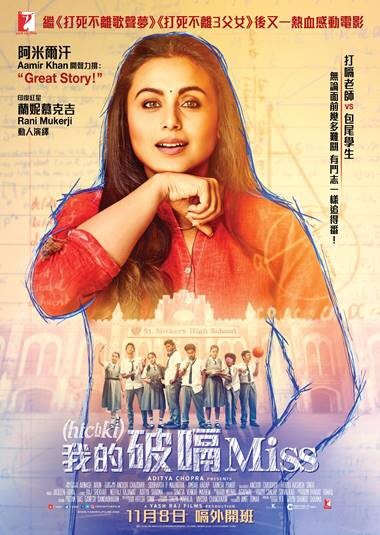 Rani Mukerji’s much loved film Hichki will release in Hong Kong on November 8 ! The film has been titled 我的破嗝Miss (My Extraordinary Teacher) for its Hong Kong release. Rani’s performance as Naina Mathur, a school teacher dealing with an involuntary nervous system disorder, Tourette Syndrome, has been widely lauded by audiences and critics alike across the world. Her brilliant performance has seen her sweep awards and accolades this year. Hichki has also been receiving worldwide acclaim and honours. It received a standing ovation at the Shanghai International Film Festival (SIFF) and Indian Film Festival of Melbourne(IFFM).